So there it is! 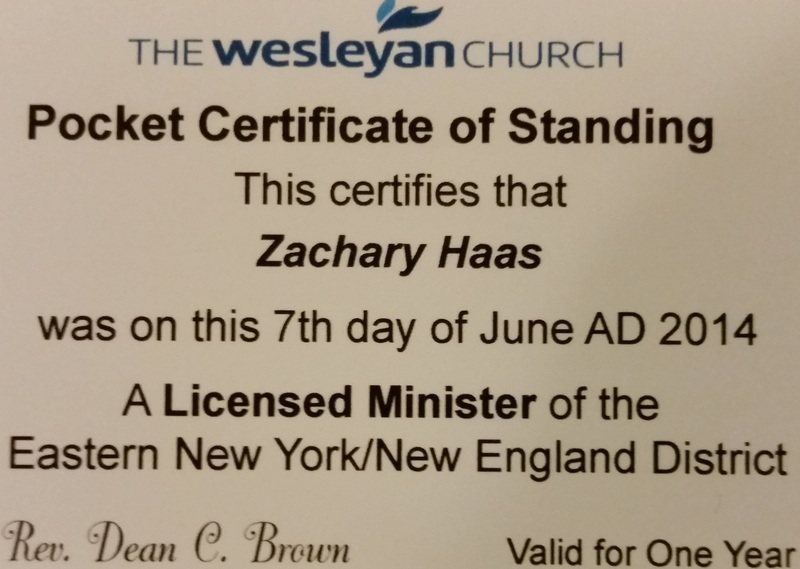 Proof that I am a licensed minister in the Wesleyan Church! My official title in my church is “Pastor of Youth Ministries.” This is the first step towards what could be my ordination in two years. While technically nothing has changed in my role at the church, it means a lot to me on an internal level. People can now call me “pastor” and it will actually be a correct descriptor. Prior to this, I always referred to myself as the youth leader, or youth director. Now, I am actually youth pastor. Perhaps there is a lot in a name. I suppose that to some extent my role has changed a bit. I have preached from the pulpit for the first time now and will probably be asked to do so in the future. Additionally, I will probably be shadowing my pastor a bit more so that I can gain experience in all aspects of being a minister. Even though my future might be more of a senior pastor role, for now I am quite content with youth ministry. This is where I am feeling called and where my passion lies. Perhaps in another post I will go into more details as to why I feel as though youth ministry is one of the most important ministries in a church. I have only read the first couple of chapters so far, but I get the gist of the book. The idea is that teenagers are being held back by standards that are set too low for them. The homeschooled brothers in this book challenge the idea that teenagers cannot do great things because they are not responsible, or old enough to succeed. Obviously everyone can think of some prodigies that go against the norm and were quite young when they started (Justin Bieber, Zach Hunter, etc). However, the authors are not talking about these rare cases. They are looking at every single teenager on the face of the earth. Their motto is essentially rebelling against rebelling. They coined the term “rebelution” to emphasize their point. So far it has been an interesting read and I look forward to continuing on. This blog is one of the ways that I think I can continue to expand my mind and continue my learning after school. I hope to have some posts in the future that are a bit more interesting to read as opposed to ones that basically focus on my life and what I am going through. Instead, I would rather focus on topics that might actually help people or challenge them or at least make them think. For now, look forward to more posts here!